If you thought last year’s The Florida Project was heartbreaking, then Capernaum just might undo you completely. Director Nadine Labaki’s painfully honest drama about a street-smart Lebanese boy who sues his parents for neglect (“for giving me life,” as he tells the judge) is relentlessly gritty, but it also never loses its humanity. The latter is largely thanks to 12-year-old Zain (Zain Al Rafeea), the compelling character at the center of the story. Because, despite every awful thing life throws in his path, he never stops caring for those who’ve earned his affection. And life throws a lot of awful things in his path. His family is poor, scrambling to feed the too-many mouths living in their squalid apartment. And his parents are resentful of their children, seeing them as burdens rather than blessings. They barely pay attention to the kids’ comings and goings — until an opportunity to “marry off” (aka sell) Zain’s beloved 11-year-old sister presents itself, and they jump at the chance. Furious and miserable, Zain takes off, planning never to return. He gets by on his own for awhile but eventually asks for help from Rahil (Yordanos Shiferaw), an undocumented Ethiopian refugee who has a baby son, Yonas, she needs to keep hidden. The trio forms an unlikely family inside Rahil’s shanty-like but somehow cozy apartment: Zain, who’s used to having babies and toddlers around, cares for Yonas while Rahil works. The two boys bond, and for awhile things are, if not ideal, good enough. But when their already tenuous arrangement takes an unexpected turn for the worse, Zain once again finds himself struggling to get by in a world dominated by manipulative, abusive, neglectful adults. And, wrong as his ensuing choices may be, it’s impossible not to empathize with him when he feels driven to drastic action. Loren King Nadine Labaki’s extraordinary neorealist film left me gutted, and grateful to be allowed such an emotional response. The film opens with 12-year-old Zain (a stunning Zain Al Rafeea, offering one of the best juvenile performances ever) in court for stabbing, as he puts it, “a sonofabitch.” Read full review. Susan Wloszczyna: Capernaum is part Oliver Twist, part Slumdog Millionaire, but with only a modicum of a fairy-tale ending. Much like last year’s The Florida Project, children pay a high price when their impoverished circumstances are the result of selfish adults who lead careless lives. The difference is that Zain (played by Zain Al Rafeea), the streetwise 12-year-old Lebanese boy who barely has room to sleep amongst his countless siblings, is playing a real-life version of himself. Read full review. MaryAnn Johanson I didn’t realize that I had already seen Nadine Labaki’s 2008 debut film, Caramel — which is delightfully wise about the secrets of women’s lives and friendships — until after I saw Capernaum. These are two very different films, to say the least; I’m not sure I’ve seen a more harrowing and heartbreaking movie in 2018 than this one. But it’s another film about perspectives that are often overlooking in male-dominated cinema: this one is about children. Of course we get lots of films about kids, but few so intimately from a child’s point of view when it comes to abuse and neglect and the resourcefulness that it can foster in a child as a way to weather it. Through the eyes of young Zain — surely one of the most memorable child protagonists in absolutely ages — Labaki slyly asks us adults to consider what we owe children. Not our own children, though of course that’s part of it, but the world’s children, all of them. That’s hardly even a question that movies about kids ask of us. Marilyn Ferdinand: Capernaum is an angry cry, through the character of Zain, for people to pay attention to and do something about the misery of others. Labaki’s greatest achievement may be that she made a beautifully crafted film with such a deep understanding for her untrained actors that it’s nearly impossible to tear our eyes from the screen or forget what we’ve witnessed. Read full review. Nell Minow: Nadine Labiki has created a real-life Dickensian drama with performances of breathtaking naturalism that echo films like The Bicycle Thief and The Florida Project. Like those films, we see the bleak, harsh world though the eyes of a child, and the film is heart-breaking, poetic, and, ultimately, both an indictment of a world that is brutal to children but a tribute to resilience and to the power of story-telling. 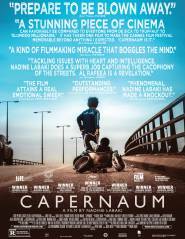 Nikki Baughan: Desperately moving and, at times, difficult to watch, Nadine Labaki’s Capernaum is resolutely unflinching in its depiction of Lebanon’s forgotten children through the gruelling experiences of 12-year-old Zain (newcomer Zain Al Rafeea, who gives a phenomenal, naturalistic performance). Forced to leave the cramped home he shares with his struggling parents and many siblings, Zain crosses paths with Ethiopian illegal immigrant Rahil (Yordanos Shiferaw), who takes him into her meagre tin-shack home. While Rahil may be able to offer him shelter and a little food, Zain soon finds himself caring for her infant son, Yonas, while she goes out to scrape a living; a responsibility for which he is ill-equipped, but which he rises to with genuine care. Read full review. Jennifer Merin In Capernaum, Lebanese filmmaker Nadine Labaki focuses her lens on the harsh realities of abject poverty on the streets of Beirut. Zain, a boy who doesn’t know his age because his ignorant, abusive parents never recorded his birth, is extremely clever, well-intentioned, resourceful and righteous, but he faces one life-destroying challenge after another and his struggle for survival is monumentally painful. First time actor Zain Al Rafeea’s performance is extraordinary. Labaki engages emotions and won’t let go. This is a film with a social conscience that calls for change. It’s one of the year’s best and most meaningful films. It is essential cinema. Anne Brodie: Nadine Labaki’s Capernaum is a well-made film that relies on a cast of first time actors in complex, demanding roles. 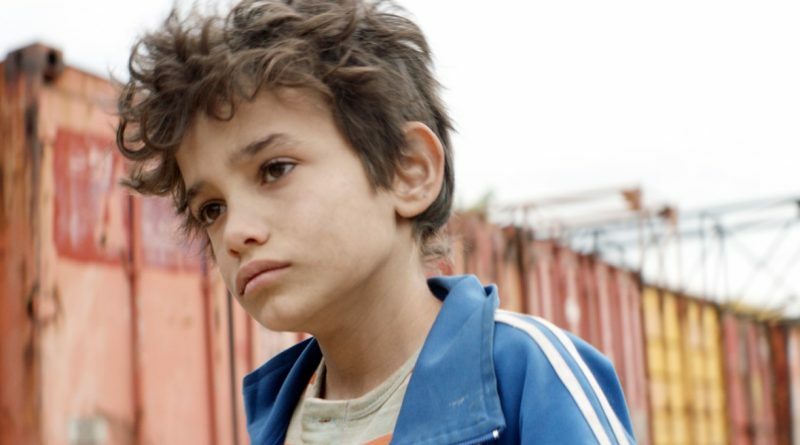 The leading boy Zain, played by Zain Al Rafeea, a Syrian refugee, lives in poverty and chaos on the streets of Lebanon. Labaki follows him over a period of time as a neglected child of abusive parents, to street urchin to ersatz mother to an infant. He feels the pain of deprivation deeply; it shows on his young face and small body and in his movements that indicate being on constant high alert. At his oldest he’s meant to be 12 but he looks eight. The two starve and he hustles for crumbs; the two may never experience safety. His short life has taught him that life is going to be very hard for him – he then sues his parents for giving him life. It’s mind-bendingly sad and you’ll keenly feel his despair. Capernaum is one of the most unsettling films of the year, and it is based on what the filmmaker has seen or experienced in the slum areas of the city – this is a seismic glimpse of the harsh realities of life on this world. It’s the Lebanese entry for the Best Foreign Language Film Academy Awards. Kristen Oage-Kirby Zain (Zain Al Rafeea) knows too much and works too hard. He’s 12-ish (he has no birth certificate) and spends his days working in a convenience store, selling stuff on the Beirut streets, and helping his parents distribute drugs. Director Nadine Labaki excels on portraying the threatening brutality (and sometimes dark humor) of Zain’s life without seeming exploitative; viewers may pity Zain, but at the same time they’ll admire him (much of this should be credited to Al Rafeea’s work, which should be ranked among the great childhood performances). Capernaum is a cinema verite look at a largely unknown urban underbelly, with a sympathetic, engaging preteen as a guide. Esther Iverem: Gritty and gripping, Capernaum is as multi-layered and complex as the region we refer to as the Middle East. While deftly touching on global crises such as migration, refugees and war, the beating red heart of this movie is its up-close portrait of women, men and children—and what family has been reduced to for much of struggling humanity. Pam Grady: The premise of Nadine Labaki’s drama is a stretch. A child, neglected and abused, denied even a rudimentary education, circumstances that eventually land him in jail, sues his parents for allowing him to be born in the first place. But from that absurd jumping off point, a powerful story emerges, delivered like a gut punch by a cast of nonprofessional actors, particularly young Zain Al Rafeea in the lead. Director/co-writer Nadine Labaki focuses her attention on Lebanon’s refugee and immigrant populations that includes kids like Zain, born in the country but essentially stateless. He doesn’t even have a birth certificate. The only kindness he’s known is from his 11-year-old sister Sahar (Cedra Izam) and Rahil (Yordanos Shiferaw), an undocumented Ethiopian, who is willing to share what little she has with a boy who has even less. The story unreels like a documentary as Labaki captures the chaos of the streets and Zain’s troubled home life. While there are moments of transcendence and grace, Zain’s story is one of horror and pain—and he is hardly alone in his hell. Cate Marquis: There are striking parallels to both Slumdog Millionaire and Charles Dickens in this grim drama, from the focus on innocent children whose lives are appalling, to indifferent parents, a cast of nefarious characters, harsh officials, and unexpected moments of kindness from strangers. Director Nadine Labaki chose to cast mostly non-actors whose lives were close to these characters. Read full review.